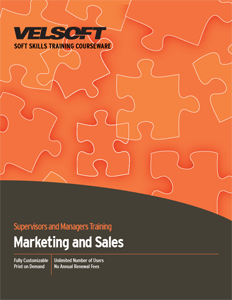 Marketing and Sales Training Material is designed for trainers to develop employees’ understanding of marketing by learning how to use marketing to increase sales with low-budget tactics. Train topics such as: top ten strategies for success, mission statements, the 4-P’s, SWOT analysis and more! Seeing is Believing This sample manual to teach Marketing and Sales is in MS Word format. A small marketing budget doesn't mean participants can't meet their goals and business objectives - participants just have to be more creative in their marketing tactics. Train staff and students how to gain maximum exposure at minimum cost. Teach effective, low-cost, and non-cost strategies to improve sales, develop your company's image, and build your bottom line. Marketing is about finding the needs of the customer and filling it. Learn how to find your niche markets and unleash your amazing product or service to the world! By targeting groups of like-minded people, it will help stretch your marketing budget, and result in more focused sales! Teach employees the definition of marketing and sales! Setting attainable marketing and sales goals with tactics and strategies will be the key to helping your organization reach success. Marketing and Sales Training Material will teach the importance of the “4 P’s” and how to effectively implement the strategies and tactics to maximize your potential. Make your training budget go further! Marketing and Sales Training Material is part of the Sales and Marketing Training Bundle and is available as an instructor-led method, eLearning, or you can implement a blended-learning scenario to cover multiple training needs of your company. Velsoft Training Materials are written and designed with the trainer in mind. The content is completely customizable to meet your training style. Simply rebrand with your company logo, add some personal flair if you like, and enter the training room with confidence. Whether you are working in a call center, trying to hire for success or speaking in public, marketing and sales training is kind of like having a Swiss army knife in the woods for survival. Equip your staff with the knowledge needed to survive in the marketing game! Want to see the topics you will train from this course? Check out the Marketing and Sales Course Outline.